Coffee grows in dozens of countries around the world. Some varieties have earned a special reputation, often based on a combination of rarity, unusual circumstances and particularly good flavor. These coffees, from Jamaican Blue Mountain to Kona to Tanzanian Peaberry, command a premium price. But perhaps no coffee in the world is in such short supply, has such unique flavors and an, um, interesting background as Kopi Luwak. 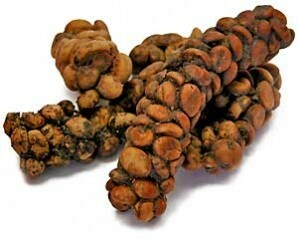 And no coffee even comes close in price: Kopi Luwak sells for $75 per quarter pound. Granted, that’s substantially less than marijuana, but it’s still unimaginably high for coffee.Kopi (the Indonesian word for coffee) Luwak comes from the islands of Sumatra, Java and Sulawesi (formerly Celebes), which are part of the Indonesian Archepelago’s 13,677 islands (only 6,000 of which are inhabited). But it’s not strictly the exotic location that makes these beans worth their weight in silver. It’s how they’re “processed.” On these Indonesian islands, there’s a small marsupial called the paradoxurus, a tree-dwelling animal that is part of the sibet family. Long regarded by the natives as pests, they climb among the coffee trees eating only the ripest, reddest coffee cherries. Who knows who first thought of it, or how or why, but what these animals eat they must also digest and eventually excrete. Some brazen or desparate — or simply lazy — local gathered the beans, which come through the digestion process fairly intact, still wrapped in layers of the cherries’ mucilage. The enzymes in the animals’ stomachs, though, appear to add something unique to the coffee’s flavor through fermentation.Curiously, Kopi Luwak isn’t the only “specialty” food that begins this way. Argan is an acacia-like tree that grows in Morocco and Mexico which, through its olive-like fruit, yields argan oil. In Morocco, the Berbers encourage goats to climb the trees to eat the fruit. They later gather the goats’ excrement and remove the pits, which they grind for oil to be used in massage, in cooking and as an aphrodisiac. What started as, presumably, a way for the natives to get coffee without climbing the trees has since evolved into the world’s priciest specialty coffee. Japan buys the bulk of Kopi Luwak, but M.P. Mountanos (800-229-1611), the first in the United States to bring in this exotic bean, imported 110 pounds after a seven year search for a reliable and stable supplier. “It’s the rarest beverage in the world,” Mark Mountanos says, estimating a total annual crop of less than 500 pounds. Richard Karno, former owner of The Novel Cafe in Santa Monica, California, got a flyer from Mountanos about Kopi Luwak and “thought it was a joke.” But Karno was intrigued, found it it was for real, and ordered a pound for a tasting. Karno sent out releases to the local press inviting them to a cupping. When no one responded, he roasted it and held a cupping for himself and his employees. Karno is very enthusiastic, a convert to Kopi Luwak. “It’s the best coffee I’ve ever tasted. It’s really good, heavy with a caramel taste, heavy body. It smells musty and jungle-like green, but it roasts up real nice. The LA Times didn’t come to our cupping, but ran a bit in their food section, which hit the AP Wire service.” And Karno and the folks at M.P. Mountanos have been inundated with calls ever since. Mountanos says, “It’s the most complex coffee I’ve ever tasted,” attributing the unusual flavors to the natural fermentation the coffee beans undergo in the paradoxurus’ digestive system. The stomach acids and enzymes are very different from fermenting beans in water. Mountanos says, “It has a little of everything pleasurable in all coffees: earthy, musty tone, the heaviest bodied I’ve ever tasted. It’s almost syrupy, and the aroma is very unique.” While it won’t be turning up in every neighborhood cafe any day soon, Mountanos reports that Starbucks bought it for cuppings within the company. In fact, most of Mountanos’ customers have bought it for special cuppings. The Coffee Critic in San Mateo, California, though, occasionally sells Kopi Luwak to the public for $5 a cup. Owner Linda Nederman says she keeps the price low to allow people to experience the coffee. Nederman says that most of her people who try it are longtime customers, and they’re “game to try something different and unusual. I’ve never had anybody complain, they all seem to feel it’s worth the price.” Nederman drinks it herself every time they brew it. “I’ve never tasted anything like it. It’s an unbelieveable taste in your mouth: richness, body, earthiness, smooth.” She also carries Jamaica Blue Mountain, Burundi Superior AA and Brazil FZA “Natural Dry,” so her customers are used to fine and exotic coffees. Still, she reports, many are afraid to try Kopi Luwak. Troy Davis, owner of Animal Coffee: http://www.animalcoffee.com/ or email:sales@animalcoffee.com, sells Kopi Luwak. Intrigued by the hype, I drove out to the Los Angeles warehouse of M.P. Mountanos to cup some Kopi with Andrew Vournas. The green beans, which range from tiny to elephant, have a faint smell that hints of a zoo or stables — a little funky, not your average coffee aroma. He lightly roasts about 21 grams, enough beans for three cups, in a Jabez Burns two barrel sample roaster, a rare and beautiful machine dating from the ’30s. Vournas gives the beans a light roast — just after the second popping — to accentuate the specific flavors of this rare coffee; a darker roast would obliterate the subtler flavors and replace them with a more generic taste. Vournas points out that this coffee, like most Indonesian-grown, has lots of moisture and roasts nicely. Vournas gives the beans a course grind and mixes seven grams of coffee with four ounces of water in each of three cups. The aroma is rich and strong, and the coffee is incredibly full bodied, almost syrupy. It’s thick with a hint of chocolate, and lingers on the tongue with a long, clean aftertaste. It’s definitely one of the most interesting and unusual cups I’ve ever had. Is it worth the money? Five dollars for a single cup? Sure, why not? You’ll pay more than that in any Paris cafe for a bad au lait. Might as well spend it on something rare and exotic.